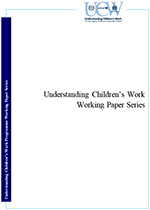 Abstract : Can a partial subsidy for child education increase children’s participation in paid work? In contrast to much of the theoretical and empirical child labor literature, we show that child work and school participation can be complements. Using data from the randomized evaluation of a conditional cash transfer program in the Philippines, we find that children who were in neither school nor work before the program increased participation in both school and work-for-pay after the program. Earlier cash transfer programs, notably those in Mexico, Brazil, and Ecuador, have been shown to increase school attendance while reducing child labor. Those programs fully offset schooling costs, while the Philippine program only provided a partial subsidy. As a result, children from poor households increased work to support their schooling, and those additional earnings represent a substantive share of the shortfall in schooling costs net of transfer. We rule out several potential alternative explanations for the increase in child labor, including changes in household productive activities, changes in adult labor supply, and changes in other household expenditure patterns that, in principle, can arise after a cash transfer.